"The Radius of my Heart" was a process-based installation piece shown at Galleri Wuthering Heights in Malmö, 24/2-5/3 2006. 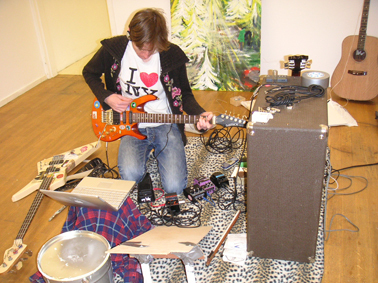 In it I explored my relationship to music, especially punk, indie-rock and noise. Most of these musical forms of expression have something extroverted, expressive and even explosive about them, yet the idea of finding and defining one's innermost being is often seen as an introspective process requiring time, attentiveness and contemplation. Eight pieces of music were recorded during the show, they are here presented in the order of their creation.